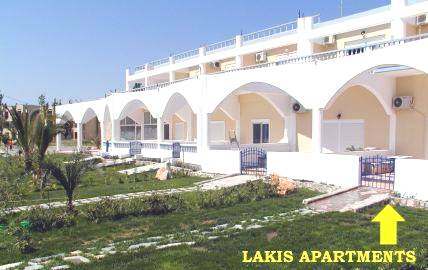 In the Family-Apartment-House LAKIS are available one big apartment and one smaller apartment. It's in the quiet south part of Faliraki on the island of Rhodes. Faliraki is one of the most famous resorts of Rhodes. You reach the beach by feet in one minute. 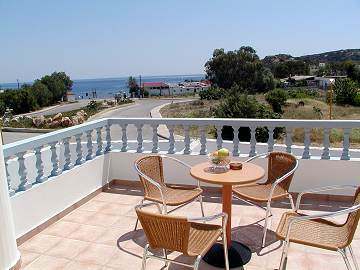 Beach taverns, restaurants and mini markets are in the nearer environs, also the small harbour of Faliraki. Different water sports you arrive quick by feet and you reach the center of Faliraki with many bars, pubs, discotheques and shopping centers within 10 minutes by feet. The broad-minded modern apartment (80 sqm) has two plains (ground floor 50 sqm, upper floor 30 sqm). One double bedroom is on the ground floor, another one on the upper floor. Other sleeping-places are in the living room on the ground floor. For this reason the apartment is very suitable for 4 persons or for max. 6 persons (with sleeping-places in the living room). In the living room is a kitchen, full fit out (refrigerator with freezer, cooking stove with hotplates and oven, water cooker, toaster and sink. In the living room is a TV and also a safe. All rooms are air-conditioned. You can adjust the air-conditioning separate for each room. The bath-room is on the ground floor and has WC, washbasin, hair-dryer and a small bath with shower. On upper floor is also a WC with washbasin. The smaller apartment (32 sqm) is also furnished complete. There is a double bedroom and another sleeping-place in the living room. It is ideal suitable for 2 persons or also for 4 persons (with sleeping-places in the living room). Cot and child's chair are available, if you ask for it. Cleaning of the rooms and towel change will be 3 times per week. The apartments are located in a new building. We would be glad, to welcome you in our house!